So you are considering buying a new TV, and of course, you wouldn’t mind sizing up to a bigger TV screen, but there may be a couple of things holding you back from getting that screen size you really want. 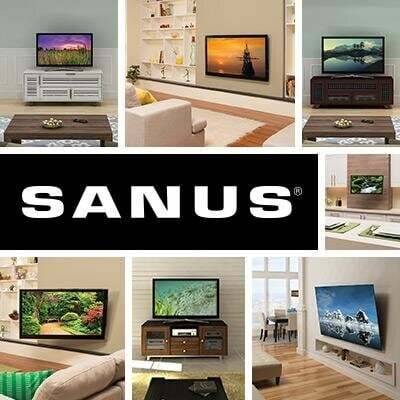 Don’t worry, we have a few tips for giving you the appearance of a larger TV using a SANUS full-motion mount. You may have financial priorities that come before buying that new TV. You know, food, shelter, saving for retirement – the usual detractors of the “fun fund." Or you have room limitations affecting the size TV you are able to buy. For instance, you may be restricted because of your window placements, your fireplace, or other things in your room that just won’t allow for a larger sized TV. Using a SANUS full-motion mount, you can actually pull your TV closer to you, thus giving you the effect of a larger TV. Because your viewing distance from the TV is reduced, you now have a bigger viewing angle and thus, a bigger TV. The amount of extension a full-motion mount provides will impact how much bigger your screen appears. For example, a full-motion mount with a 10 inch extension, will bring your TV 10 inches closer to you. If you’re looking to create an even more dramatic “increase” in screen size, you can find full-motion mounts with even greater extension, like the SANUS full-motion OLF18 that adds up to 18 inches of extension. And when you’re done watching TV, you can easily return your TV to its original position flush against the wall. Need more help figuring out the right TV viewing distance? Check out our video on TV Size vs. Couch Position.